In my last post (Mr Z and the Christian View of Mathematics), I told how my high school maths teacher, Mr Larry Zimmerman, taught us to see mathematics as it is, one of the ways God revealed different attributes of Himself in His awesome work of creation. 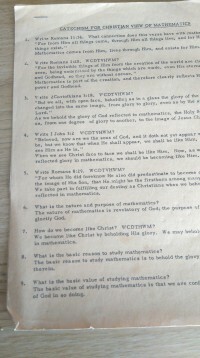 I mentioned in that post the “dreaded brown sheets,” Mr Z’s “Catechism for the Christian View of Mathematics.” We had to be prepared to answer questions from this catechism on our regular mathematics exams. This was certainly effective — many of his students may have forgotten the particular questions and verses, but few will have forgotten the principles he taught. Here, then is Larry Zimmerman’s “Catechism.” I guess this may have developed somewhat through the years, there are a few changes in the online version, which is in the second appendix of his book. This, though, is my blog 🙂 , so you get my copy, the one I learned all those years ago, from those “dreaded brown sheets.” The later version develops a few of these questions a little more completely, or frames the questions and answers more clearly, but I feel an attachment to those brown sheets, so here it is as we learned it. Mathematics comes from Him, lives through Him, and exists for Him. 2. Write Romans 1:20. WCDTVHWM? Mathematics is part of the creation, and therefore clearly reflects His eternal power and Godhead. 3. Write 2 Corinthians 3:18. WCDTVHWM? As we behold the glory of God reflected in mathematics, the Holy Spirit conforms us, from one degree of glory to another, to the image of Jesus Christ. 4. Write 1 John 3:2. WCDTVHWM? glory in mathematics, we should be becoming like Him. 5. Write Romans 8:29. WCDTVHWM? We take part in fulfilling our destiny as Christians when we behold God’s glory reflected in mathematics. 6. What is the nature and purpose of mathematics? The nature of mathematics is revelatory of God; the purpose of mathematics is to glorify God. 7. How do we become like Christ? WCDTHWM? We become like Christ by beholding His glory. We may behold His glory reflected in mathematics. 8. What is the basic reason to study mathematics? The basic reason to study mathematics is to behold the glory of God reflected therein. 9. What is the basic value of studying mathematics? The basic value of studying mathematics is that we are conformed to the image of God in so doing. 10. Write Romans 10:17. WCDTVHWM? The spiritual sight (faith) we need to behold God’s glory reflected in the mirror of mathematics comes from the word of God. 11. Write a verse which implies that God created mathematics. 12. Write a verse which implies that God’s glory is reflected in mathematics. 13. List 3 attributes of God reflected in mathematics. 14. Give an example from mathematics which reflects the infinity of the Creator. Infinitely many infinite sets of infinite decimals between infinitely many pairs of infinite decimals on the infinite number line. 15. Give an example of a unifying element in mathematics. Why are we not surprised to find these? Sets, vectors. Because one Person created the whole thing. 16. How do we know that God created mathematics? 17. Write a verse which gives the source of the faith we need to behold God’s glory in mathematics. 18. What is the main value of studying applications of mathematics? To be sure we are dealing with true mathematics, created by God, and not with the product of some man’s vain imagination. 19. Give one example of the power of God reflected in mathematics. Solution to an equation. Rocket to the moon. 20. A non-believer says, “Man invented mathematics.” How would you argue against him? Mathematics is an abstraction (or model) of nature, which man obviously didn’t invent. So many different people in different parts of the world at different times contributed to mathematical thought that we would expect it to be disjointed and fragmented. Instead, there is unity and universality. 21. How does coordinate geometry remind us of the Creator? It demonstrates the unity between geometry and algebra, which we expect to find because one Person created both. 22. Write Romans 1:20. What are the “invisible things” mentioned in this verse? God’s eternal power and Godhead. 23. Write Romans 1:20. What two meanings could be assigned to the phrase “from the creation of the world”? Ever since the time when the world was created; from the physical features of the creation. 24. How can you tell whether a statement is true mathematical discovery or simply the product of someone’s vain imagination? It is an abstraction (model) from the physical creation or an application to the physical creation. 25. A Christian student says of math, “Why do we have to study this junk?” What would be an acceptable answer? What God has created call not thou junk. 26. Discuss the relationship among Romans 8:29, II Corinthians 3:18, 1 John 3:2, Romans 1:20, and mathematics. A diagram will suffice. We look for the revelation of God’s glory implicitly in math; not for an object lesson. Also, it is very dangerous to say that the Trinity resembles anything. An entity which always exists in the mind of God, for us the universal expression of His creative and sustaining word of power. This last point, #28, was handwritten on the sheet, showing that Mr Z was still learning and developing his understanding of our God and His mathematical handiwork, even as he was instructing us. It was the “present” column from #26 above in action. And this is the main reason I decided to go ahead and post this old form of the catechism, rather than the new. Mr Z taught us, and lived it himself, to learn of our God from His creation. If he continued to do that, of course he would continue to develop his thinking on this topic. That Mr Z’s catechism, despite being fundamentally the same, developed over the years simply demonstrates the truth of what he taught. If we keep looking for the things of God, we will keep learning more and more of them, whether in mathematics or something else. He did that, as these two copies of his catechism illustrate. Now that you’ve read this old version, you really must go and read the new. This entry was posted in Daily Christianity, The Christian and Culture and tagged Christian Education, Creation, Larry Zimmerman, Mathematics. Bookmark the permalink. Thank you for posting the philosophy and catechism. They are a real help to me. We have been talking about making sure that our education at school is distinctly Christian. These documents will give us food for thought. Hello, Sharlene. I hope it is helpful! Teaching children to see the Lord’s hand in everything is a wonderful ministry. Thank you for sharing these, Jon. I have passed them along to our church’s private school. Thank you, David. If the students internalise these truths, they will be valuable to them throughout life. I heard from one of our teachers, an engineer by training, that she had long thought that mathematics after, say 1890, really was invented by man. She was *so* blessed by reading chapter 1 of Mr. Zimmerman’s book and seeing that God really is the author behind ALL of creation and our studies! Thank you again for posting this! That’s great, David! Thank you for coming back to tell me. Jon – thank you so much for these last two blog posts. I’m currently teaching a SS class on apologetics and one of the things like like to present is something along the lines of the apologetic value of mathematics. These ideas here would fit in perfectly. Thank you, Andy, for the encouragement, and I am glad this is helpful to you. Our God did not leave Himself without witness, did He?